After the confusion I have had myself over the years, I thought a few notes on Bratislava’s actually very good but initially flummoxing public transport system might come in handy. There is very little thorough info in English on the web so: voila. 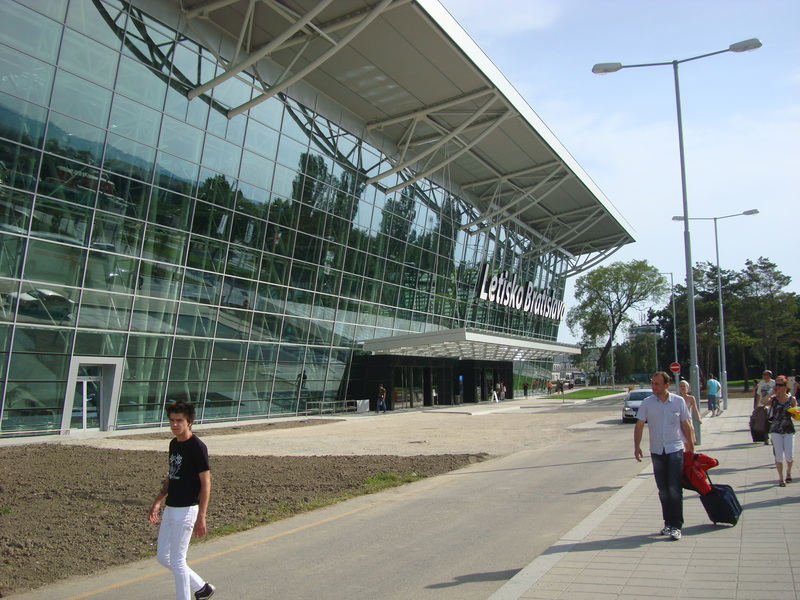 This post is about getting from Bratislava Airport, aka M. R. Štefánik Airport (which is the way nearly all Brits arrive) to the centre. Slovakia does not have its own airline, meaning Ryanair has almost become the (bone-shakingly bumpy) substitute. Don’t worry though: most flights still land with almost zero fatality rate. There is a reason a lot of British visitors arrive by air other than simple logistics: Bratislava is connected to London Luton, London Stansted, Birmingham, Liverpool and Edinburgh – making the UK easily the most connected country to Slovakia by air. (NB – you can also fly from London to Košice and from London to Poprad in the High Tatras). For buses, walk across the taxi rank/pick-up/drop-off road (using the pedestrian crossing) to the second pavement. Turn right. Walk along (just where the happy chappy with the wheelie bag in the picture is going) until you see the bus stop for busses to all city destinations at the end of the pavement. There is a shelter, some ticket machines and several other anxious first-time visitors like yourself waiting there, along with the usual group of grimly determined locals (to be joined by a lot of exuberant teenagers just one stop later when you pass the nearby Avion Shopping Centre). A word about the ticket machines. They do not take credit cards, British pounds, American dollars, forints or indeed any other currency than Euros. So have some Euro change handy. For journeys of 15 minutes or less, press the button for the 0.70 Euro ticket. For journeys of 15 minutes up to one hour (into which category any journey to the city centre, including yours, will almost certainly fall) get the option for the 0.90 Euro ticket. Remember that you must validate your bus ticket on-board for bus 61 and any Bratislava city public transport. If you don’t validate the ticket (you’ll see the little validation machines by the doors on the bus) your ticket will be essentially invalid and you can face a 50 Euro+ fine! OK. Now you are ready to get your bus. This bus, run by Slovaklines in conjunction with Eurolines, runs between Bratislava Airport and Vienna’s central train station, Vienna HBF. En route, it will stop in Bratislava at the bus station and then the train station, in the town of Hainburg just across the border in Austria (that’s where Slovaks go to do shopping because… no, no, that’s another article), at Vienna’s Schwechat Airport and then on to the centre of Vienna at Vienna HBF (Hauptbahnhof, the main central train station). Here is a link to the latest timetable for the route. The first bus is 8:30am from the airport; the last is 9:35pm (so for the late-night flights arriving from the UK this option won’t be possible; you’ll need to wait an hour for the last Blaguss service, below). Journey time to central Bratislava is 30 minutes and to central Vienna one hour 30 minutes (three services stop at Erdbergstrasse, which is 1:10, but to Vienna HBF it’s 1:30). The full journey from Bratislava to central Vienna costs 7.50 Euros (luggage is 1 Euro extra). If you’re headed to the city centre, you can take this option too but there is little point as Bus 61 below is cheaper and more frequent. There are 7 services between Bratislava Airport and central Vienna daily. This service offers almost exactly the same route as the Slovaklines Bratislava-Vienna bus above: only with even fewer stops (and also 7.50 Euros to central Vienna). This service just calls at the airport, Most SNP bus station, Petržalka Einsteinova, Vienna’s Schwechat Airport and central Vienna’s Erdbergstrasse. Here’s a link to the latest timetable for the route. The first bus is an incredible 4am from Bratislava Airport, the last is 22:45. Bratislava airport-central Vienna travel time is billed as one hour 15 minutes although in reality this can take a little longer. There are 14 services between Bratislava Airport and central Vienna daily. This Bratislava city bus links the airport (signposted only as “letisko” in Bratislava) with the train station and runs up until at least midnight. This bus runs every 15 minutes but can get crowded. Try and get a seat (at the airport you should be able to) and keep your luggage in sight. The following stop (in Slovak: zastávka) will be announced on a very futuristic talking scoreboard (wo, yeah!) The stop of interest you will need to watch out for is Račianske Mýto (the name translates as Rača tollway because in times gone by this would have demarcated the edge of Bratislava and Rača (now a suburb) would have been a separate settlement). Get off at Račianske Mýto to change for connections to the city centre. Otherwise this bus continues to, you’ve guessed it, the train station (Hlavná Stanica). From where the bus drops you on the far side of Račianske Mýto*, you have to double half-way back across the main road to the tram line to catch the tram to the city centre. You’ll see which way the trams are heading and you want those that are heading right (as you stand with your back to the terrible-looking restaurant and the park, facing the way you’ve come) to take you direct into the city centre. Getting tram number 5 is best (although tram 3 will also take you to the centre). After three stops on tram 5 (trams every 10 min or so, your ticket you got at the airport still covers you) you’ll enter the pedestrianised Obchodná street. Get off at the second stop on this street (so four after Račianske Mýto) at the stop called Postová for destinations in the Old Town centre. At Postová, continue to the next big crossroads (a beautiful church known as Kostol Nasvätejšej Trojice is now on your right) and straight across the tram lines is the very pretty entrance to Bratislava Old Town. You are very unlikely to need the bus out to Petržalka (more, much more on Petržalka in other forthcoming posts, including the lovely cycle ride from Petržalka to Danubiana Art Museum or the new tram line that’s set to connect Petržalka with the city centre by 2016) when you first arrive in Bratislava but there is that option too. Right. You’ve arrived. Thank Goodness for that. After the confusion I have had myself over the years, I thought a few notes on Bratislava’s actually very good but initially flummoxing public transport system might come in handy. There is very little thorough info in English on the web so: voila. This first post is about getting from the airport (which is the way nearly all Brits arrive) to the centre. Remember that you must validate your bus ticket on-board for bus 61 and any Bratislava city public transport. If you don’t validate the ticket (you’ll see the little validation machines by the doors on the bus) your ticket will be essentially invalid and you can face a 50 Euro fine! OK. Now you are ready to get your bus. This bus, run by Slovaklines in conjunction with Eurolines, runs between Bratislava Airport and Vienna’s Sudtiroler Platz. En route, it will stop in Bratislava at the bus station and then the train station, in the town of Hainburg just across the border in Austria (that’s where Slovaks go to do shopping because… no, no, that’s another blog post), at Vienna’s Schwechat Airport and then on to the centre of Vienna at Sudtiroler Platz. Here is a link to the latest timetable for the route. The first bus is 8:30am from the airport; the last is 9:35pm (so for the late-night flights arriving from the UK this option won’t be possible; you’ll need to wait an hour for the last Blaguss service, below). Journey time to central Bratislava is 30 minutes and to central Vienna one hour 35-one hour 55 minutes (three services stop at Erdbergstrasse, which is 1:35, but to Sudtiroler Platz it’s 1:55). The full journey from Bratislava to central Vienna costs 7.70 Euros (luggage is 1 Euro extra). If you’re headed to the city centre, you can take this option too but there is little point as Bus 61 below is cheaper and more frequent. This service offers almost exactly the same route as the Slovaklines Bratislava-Vienna bus above: only with even fewer stops (perhaps why they charge a hefty 2 Euros more: 10 Euros to central Vienna). This service just calls at the airport, Most SNP bus station, Petržalka Einsteinova, Vienna’s Schwechat Airport and central Vienna’s Erdbergstrasse. Here’s a link to the latest timetable for the route. The first bus is an incredible 4am from Bratislava Airport, the last is 22:45. Bratislava airport-central Vienna travel time is billed as one hour 15 minutes although in reality this can take a little longer. This Bratislava city bus links the airport (signposted only as “letisko” in Bratislava) with the train station and runs up until at least midnight. This bus runs every 15 minutes but can get crowded. Try and get a seat (at the airport you should be able to) and keep your luggage in sight. The following stop (in Slovak: zastávka) will be announced on a very futuristic talking scoreboard (wo, yeah!) The stop of interest you will need to watch out for is Račianske Mýto (the name translates as Rača tollway because in times gone by this would have demarcated the edge of Bratislava and Rača, where I live (now a suburb) would have been a separate settlement). Get off at Račianske Mýto to change for connections to the city centre. Otherwise this bus continues to, you’ve guessed it, the train station (Hlavná Stanica). You are very unlikely to need the bus out to Petržalka (more, much more on Petržalka in other forthcoming posts, including the lovely cycle ride from Petržalka to Danubiana Art Museum or the new tram line that’s set to connect Petržalka with the city centre) when you first arrive in Bratislava but there is that option too.